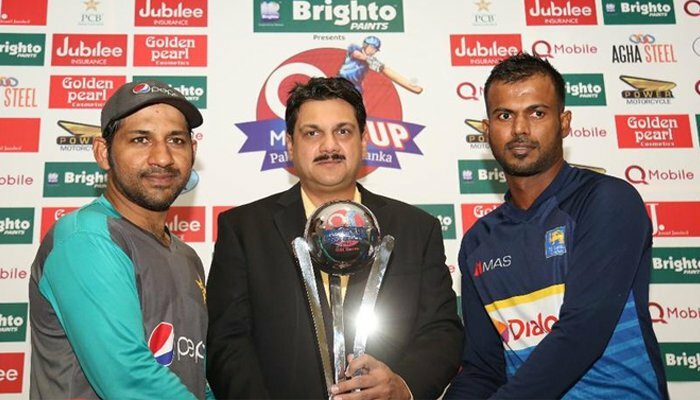 DUBAI: A half-century by Babar Azam helped Pakistan stabilise after the loss of early wickets as Pakistan got off to a slow start after Sri Lanka won the toss and elected to field in the ODI series opener on Friday. Fakhar Zaman and Mohammad Hafeez both fell during the middle overs, putting further pressure on the team. Hafeez was caught on a ball by Vandersay as he tried to pull towards long-on while Zaman was tricked by Dananjaya’s googly. Pakistan were rattled after opener Ahmed Shahzad was dismissed for a duck after facing 12 deliveries. The team was counting on a change in format and players to overcome a resurgent Sri Lanka in the five-match one-day series, after facing a 2-0 upset in the preceding Test series. But they are hoping to change their fortunes and carry the limited over form which helped them win the eight-nation Champions Trophy held in England in June this year. They only have skipper Sarfraz Ahmed, batsmen Haris Sohail and Babar Azam and fast bowler Hasan Ali from the Test series, while experienced all-rounder Mohammad Hafeez and opener Ahmed Shahzad amongst the 11 who joined the squad. Sarfraz feels the pressure of losing his first Test series but promised a better performance in the limited over matches. “Obviously, when you have a first Test series as captain, and you lose it, pressure will be there,” said Sarfraz who played a match winning 61 not out against Sri Lanka in the Champions Trophy group match. Pakistan also have a young crop of fast emerging players in opener Fakhar Zaman — who hit a century in the Champions Trophy final against India — leg-spinner Shadab Khan, all-rounders Imad Wasim and Faheem Ashraf, and pacers Rumman Raees, Junaid Khan and Usman Shinwari. Spearhead Mohammad Amir was ruled out of the series with a shin injury sustained in the second Test in Dubai. Pakistan´s loss in the Test series was their first in United Arab Emirates in 10 attempts since they were forced to play at a neutral venue amidst security fears sparked after 2009 attacks on the Sri Lankan team bus in Lahore. But their one-day record in UAE has been abysmal, having lost nine of the 12 series since 2009, only winning twice against Sri Lanka and once against the West Indies. Sri Lanka have come from wretched one-day form, having lost 16 of their last 21 games, winning four with one no result. That included a 5-0 whitewash against South Africa and India and first-ever series defeat against minnows Zimbabwe. That defeat against India last month put pressure on skipper Upul Tharanga. “We lacked consistency. We didn´t bat, bowl or field well. We were outplayed by India. I am disappointed with our batting effort,” said Tharanga whose team failed to reach 250 in any of the matches. The remaining matches are in Abu Dhabi (16 and 18 October) and Sharjah (October 20 and 23). Three T20 matches will follow the ODIs, two in Abu Dhabi (October 26 and 27) and the last in Lahore (October 29).